Instantbird 1.0 released in 11 locales! The Instantbird team is pleased to announce a polished Instantbird 1.0, released today in 11 locales. 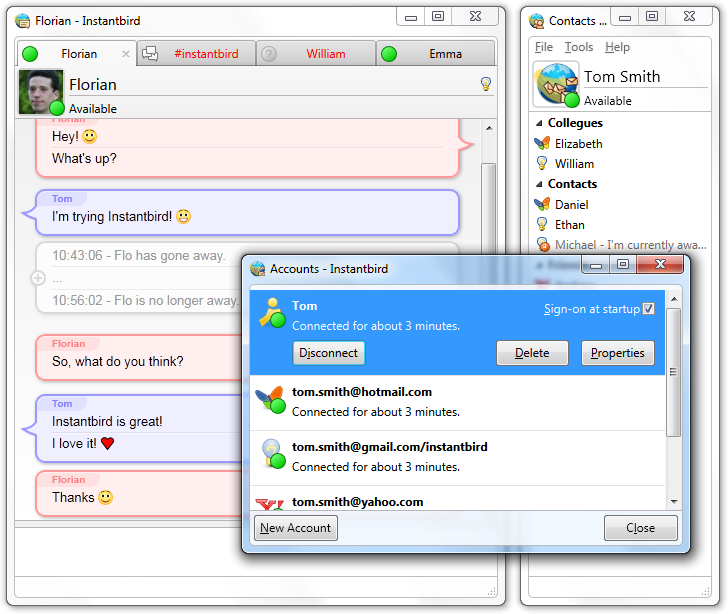 Instantbird is an extremely easy to use and highly extensible instant messaging client that aims to respect its users! Building on the experience available via open-source software, Instantbird is able to harness the power of Pidgin (via its libpurple protocol library) and of Mozilla’s Firefox technology, to provide access to a wide variety of instant messaging networks, while providing an easy (and well known) extension platform. Although Instantbird is fully cross-platform (Windows, Mac OS X, Linux), we strive to present a native look-and-feel to the user interface. But also many others like: Gadu-Gadu, Novell Groupwise, ICQ, IRC, MySpaceIM, Netsoul, QQ, SIMPLE, Yahoo! JAPAN, and even more optionally available on the Instantbird Add-Ons website, such as Omegle and LJ Talk (LiveJournal). Vertical Tabs — too many conversations open? Move the tabs from horizontal to vertical! As part of our belief in respecting our users, we give them an ad-free experience and respect their privacy by not collecting any information about them (Instantbird contacts our servers only when checking for updates, or in the unfortunate and uncommon event of a crash). The Instantbird team is a group of volunteers who are passionate about empowering instant messaging users by providing a stable, fun instant messenger. Read more about who we are and our core beliefs and values. While Instantbird has received invaluable support from the Mozilla community at large, it hasn’t been funded in any way by the Mozilla Foundation. The company-quality infrastructure deployed to build and support Instantbird has been funded by the initial creators who strongly believe in the importance of this project. The increasingly fast growth of Instantbird’s user base leads us to believe the project could find some user-respecting revenue streams from which the project could become economically sustainable and empower the non-profit created for it to start hiring key contributors, following a model similar to what Mozilla has been doing with Firefox. We’d like to thank all of our contributors and translators who have helped build Instantbird. In addition, we’d also like to thank our invaluable beta and nightly testers who provide timely bug reports and help track down regressions! Thanks for taking the time to check out Instantbird, if you like it please share it with your friends; if you’re sharing it with your non-English-speaking friends, the website is now localized too! If you have questions feel free to contact us. If you are writing about Instantbird and need a logo or are out of time to produce screenshots, we have image resources for you. If this is more convenient to you, this announcement is also available in a press release format. This entry was posted in Downloads and tagged 1.0, announce, downloads by clokep. Bookmark the permalink. Only thing i miss is the "busy" status option (MSN). Other than that, it has everything needed on a daily basis. @Cane: The ‘Unavailable’ status is the same as the ‘busy’ status :). "Over capacity! Due to an unprecedented affluence, this server is currently over capacity. We are doing our best to bring this service back online as soon as possible. Thanks for your interest in Instantbird!" +1 Peter; looking forward to switching to this, but it’s tough without e.g. tab completion in IRC. @Peter: As soon as possible. But with the load we currently have, it’s obviously not going to happen before a couple of hours, maybe even a day or two. @Florian: Thanks! With tab completion, I can now recommend Instantbird over Pidgin + xChat. Looking forward to browsing the other addons once you get more capacity! Nice app! But I canÂ´t connect to Facebook Chat "Connection not possible". Are there options for (de)activating SSL/TLS for Facebook Chat? Could you please provide a 64-bit Linux version? @SwooopD: The facebook chat XMPP gateway doesn’t officially support SSL, so there’s no option for that in the UI. If you want to play with unsupported settings (some poeple have recently reported that SSL works), you can create your facebook account as an account of the ‘XMPP’ protocol and you will have all connection options to play with. @Nono: We don’t really have the resource to support these builds (by support I mean automatic updates, crash reporting, …) but we may produce a set of builds and just drop them in a folder of our download server. Any chance of bringing back support for SameTime? I saw it mentioned in the previous releases, but it seems to have gone away? @Yong We have received a few requests for SameTime support since the 1.0 release so we will consider bringing it back, yes. how to search invisible contacts to send messages. need inputs for this issue. I’m not sure what you mean by “search invisible contacts”, if a contact is invisible you will just see them as offline. how can i create a multi-user chat?